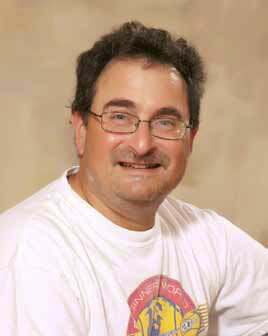 Mark Platt was named one of the top 5 tennis teachers in the United States by Tennis Magazines Buyer's Guide May 1991. Mark was commended as an outstanding tennis marketer through his programs. One of those programs -- Beginner's World Tennis. Beginner's World Tennis was conceived in 1984 by Mark Platt to provide an all-encompassing program specifically geared to the beginning tennis player: parties, team tennis leagues, community-based lessons and special events. This year alone, 10,000 men, women, teenagers and children will learn to enjoy tennis on many different levels, thanks to Mark, his energetic staff and the Beginner's World Tennis innovative approach.. When Beginner's World Tennis introduces the game to the new student, an average of seven out of ten players commit to the sport... the national average is only five out of ten new players. Beginner's World Tennis prides itself on progressive instruction and high energy demonstration along with participation. Beginner's World Tennis is the place for you to learn to play tennis in a relaxed, non-judgemental and friendly atmosphere. Contact us today or find out on the web for current program schedule. How did you get your start in tennis? I began my tennis career in the 1960s when I enrolled in a free tennis program in University City, Missouri. I was fortunate enough to take private lessons from Earl Buchholz, Sr., who was the premier grass roots tennis coach at that time. His son, Butch, became one of the top eight players in the world. What made you want to teach tennis? My love of tennis continued and in 1976 I started teaching tennis and directing the free University City tennis program. Teaching tennis is very rewarding because it gives me the ability to mentor junior players to help them further their education and realize their life's passion. To help accomplish this personal goal, I developed the Rockwood School District Tennis Program which is a middle school tennis league between all six Rockwood middle schools. This inspired me to create a Mobile Tennis Academy, which helped expand tennis to include children and young adults from the Clayton, Ladue, Parkway, Hazelwood, Mehlville and Lindbergh School Districts. Do you have any memories as a coach that stand out for you? One of my most memorable players that I coached was Yelena Podorozhansky. She become a nationally-ranked USTA player and because of her hard work, she received a full tennis scholarship to the University of Missouri-Kansas City's six year medical program. Sharre Smith is another young woman I currently coach and mentor. She attends Whitfield High School and is a number one seed and district champion. One of my current tennis instructors, Kelsey Brendell, started out playing pee-wee tennis with me when she was in kindergarten. She continued playing in my tennis program, Beginners World Tennis, through high school, became a three-time state medalist and received a full tennis scholarship to college. She has been working for me for the last seven years. You've done some work with the St. Louis University freshman orientation program, introducing tennis to young people there. Tell us a little bit about that. For the past 10 years, as part of the freshman orientation at St. Louis University, I've operated a very successful tennis rally. The F.U.N. event (Freshman University Network) called "You've Got the Hookup" which has over 500 participants. During one freshman orientation, I noticed a small group of Chinese international students looking lost so I invited them to participate in the event and they loved it. In 2011, Sam Kelner, Intramurals and Sports Clubs Program Coordinator at St. Louis University, invited all 600 Chinese students to come to our event. In the end, 300 Chinese students attended last year and thoroughly enjoyed the tournament. Sunrise Chinese Restaurant even provided food for the event. Why do you think it's important to use tennis to reach out to different populations? In addition to providing tennis instruction to all age groups, I've always enjoyed being able to facilitate social networking for the greater St. Louis area with diverse groups. I have created large outreach tennis programs in over 50 gyms and tennis facilities that have created exposure and inclusion to our tennis community for all ethnic backgrounds. These programs include beginners to potential US Open champions. Currently, Alan Okanovic, who is seven years old and of Serbian heritage, is a fine example of how strong grass-roots tennis programs are to help identify and foster future champs. To anyone, young or old I wholeheartedly endorse tennis! This is a sport that lasts a lifetime. It allows you to set individual goals, develop a plan to meet those goals, and give back to your community. It's also a great way to meet people and develop friendships that can last a lifetime. Many of my students have volunteered at USTA Block parties, St. Louis University F.U.N. 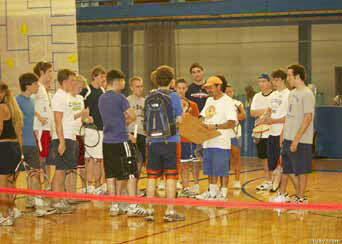 Tennis Rallies, Rally Tennis for Cancer Care and at the Central Institute for the Deaf. So I encourage everyone to get involved. What do you like to do when you're not on the tennis court? When I'm not teaching tennis I love yoga, playing the drums, playing golf with my wife, Jeannie, and gourmet cooking. One of my favorite things to cook is a rack of lamb with Dijon mustard. My friends tell me I make the best Italian meatballs with stuffed mozzarella. They're delish! This page is designed and maintained by Andrey Podorozhansky andreypo@hotmail.com Graphic design by Kangrga Design, Inc.